For the New Zealand rower, see Georgia Perry. Perry is a city in Houston and Peach counties in the U.S. state of Georgia. It is the county seat of Houston County. The population was 13,839 at the 2010 census, up from 9,602 at the 2000 census. As of 2015 the estimated population was 15,457. It is part of the Warner Robins, Georgia Metropolitan Statistical Area, within the Macon–Bibb County–Warner Robins Combined Statistical Area. Perry is perhaps best known as the location of the annual Georgia National Fair. Founded in 1823 as "Wattsville", the town was located near the center of Houston County and served as its courthouse. The name was soon changed to honor Commodore Oliver Hazard Perry, a hero of the War of 1812. 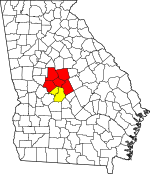 The Georgia General Assembly incorporated the town on December 9, 1824. The original city limit was a circle, one mile in diameter, except where bounded on the north by Big Indian Creek. Antebellum industry in Perry included gristmills, sawmills, and cotton gins. The Houston Home Journal (now the Houston Times-Journal) began publishing in 1870. Cotton was the most significant commodity crop into the 20th century. Tourism has been important to the local economy since about 1920, when U.S. Highway 41 to Florida was paved. The New Perry Hotel, built in 1870 and rebuilt in 1925, became a landmark for many Florida tourists. President Jimmy Carter's family frequented the hotel. The downtown area has emphasized its historic heritage and has several quaint shops and restaurants. Since World War II, when Robins Air Force Base was established in nearby Warner Robins, the military has been a significant employer in the area. Warner Robins is several times larger than Perry. Other manufacturers in the city have included Frito-Lay, Perdue Farms (formally Heileman Brewing Co.), and Cemex, Inc. (formally Penn-Dixie Cement and Medusa Cement Company). In the early 1960s Interstate 75 was constructed through the western side of the city. It has attracted more businesses that cater to travelers. The Georgia National Fairgrounds and Agricenter opened in 1990. The Go Fish Georgia Education Center opened October 8, 2010. Perry is located in west-central Houston County at 32°27′54″N 83°43′16″W﻿ / ﻿32.46500°N 83.72111°W﻿ / 32.46500; -83.72111 (32.464940, −83.721163). The city limits extend northwest into Peach County. It is on Big Indian Creek, a tributary of the Ocmulgee River. U.S. Highway 41 passes through the center of Perry, leading north 30 miles (48 km) to Macon and south 16 miles (26 km) to Unadilla. Interstate 75, the major north-south artery through Georgia, passes through the western side of Perry, with access from Exits 134 through 138. I-75 leads north 106 miles (171 km) to Atlanta and south 123 miles (198 km) to Valdosta. U.S. Highway 341 also passes through Perry, leading northwest 12 miles (19 km) to Fort Valley and southeast 21 miles (34 km) to Hawkinsville. According to the United States Census Bureau, Perry has a total area of 26.3 square miles (68.1 km2), of which 26.2 square miles (67.8 km2) are land and 0.1 square miles (0.3 km2), or 0.48%, are water. The Georgia National Fair is a state-sponsored fair that is held every October at the Georgia National Fairgrounds and Agricenter in the southern part of Perry. The fair is an 11-day event offering a wide range of activities and shows, such as agricultural, livestock and horse shows, home and fine arts competitions, youth organization events (4-H, FBLA, FCCLA, FFA, and TSA), circus, midway rides and games, fair food, major live music concerts in Reaves Arena, family entertainment, and nightly fireworks. The Go Fish Education Center takes visitors on an educational journey through Georgia's watersheds to learn about the diverse aquatic wildlife, their natural habitats and the impact of water pollution. Visitors can see freshwater aquariums, explore underwater habitats, view aquatic wildlife, catch fish in a stocked pond, view a movie exploring Georgia's fishing options and traditions, and try out interactive fishing and boating simulators. The Go Fish Education Center is part of the Georgia Department of Natural Resources, Wildlife Resources Division (Fisheries Management Section). The hours are Friday & Saturday 9:00 am to 5:00 pm and Sunday 1:00 pm to 5:00 pm. The center is reserved Tuesday through Thursday for school field trips and other groups. The City of Perry and Perry Main Street Program present the Perry Buzzard Drop each New Year's Eve. The event includes live entertainment, spirits sold on site, a dance contest, and souvenir memorabilia. The Perry Area Historical Museum was founded to identify, protect and preserve the area's historical landmarks, artifacts, and histories of its people. Exhibits include military, social, agricultural, fashion, education, and political memorabilia. Services offered by the museum include a heritage library of local and regional publications, records, documents, family histories, and other research material. Programs offered include guided tours, special events, kids programs, and activities. The hours are Tuesday through Thursday, 10:00 am to 12:00 noon and 2:00 pm to 4:00 pm. The museum is also open by appointment. The Dogwood Festival is held the second weekend of April each year in downtown Perry. For each festival, there is a pageant, arts, crafts, food vendors, kids zone, youth entertainment stage, dog dock-diving competitions, and hot air balloon rally. As of the census of 2000, there were 9,602 people, 3,720 households, and 2,574 families residing in the city. The population density was 584.7 people per square mile (225.8/km²). There were 4,053 housing units at an average density of 246.8 per square mile (95.3/km²). The racial makeup of the city was 59.53% White, 37.18% African American, 0.21% Native American, 1.25% Asian, 0.04% Pacific Islander, 0.90% from other races, and 0.90% from two or more races. Hispanic or Latino of any race were 1.85% of the population. There were 3,720 households out of which 32.8% had children under the age of 18 living with them, 45.2% were married couples living together, 19.7% had a female householder with no husband present, and 30.8% were non-families. 26.8% of all households were made up of individuals and 10.3% had someone living alone who was 65 years of age or older. The average household size was 2.50 and the average family size was 3.03. In the city, the population was spread out with 25.9% under the age of 18, 9.8% from 18 to 24, 30.1% from 25 to 44, 20.2% from 45 to 64, and 14.0% who were 65 years of age or older. The median age was 35 years. For every 100 females, there were 89.9 males. For every 100 females age 18 and over, there were 84.6 males. The median income for a household in the city was $31,418, and the median income for a family was $38,480. Males had a median income of $35,870 versus $21,136 for females. The per capita income for the city was $18,266. About 15.6% of families and 18.8% of the population were below the poverty line, including 24.4% of those under age 18 and 15.4% of those age 65 or over. Richard Ray, former United States Representative. ^ "Perry". City of Perry, Georgia. Archived from the original on May 10, 2017. Retrieved May 19, 2017. ^ "US Board on Geographic Names". United States Geological Survey. October 25, 2007. Archived from the original on February 26, 2012. Retrieved January 31, 2008. ^ a b "Geographic Identifiers: 2010 Demographic Profile Data (G001): Perry city, Georgia". American Factfinder. U.S. Census Bureau. Retrieved May 19, 2017. ^ Becker, Jim. "Seniors Visit Georgie". Senior Citizen Travel. Mandarich Media Group. Retrieved February 24, 2019. ^ Barone, Michael; Ujifusa, Grant (1987). The Almanac of American Politics 1988. National Journal. p. 295. Bobbe Hickson Nelson, A Land So Dedicated: Houston County, Georgia ([Perry, Ga.], 1977) OCLC 3597733. This page was last edited on 24 February 2019, at 22:43 (UTC).